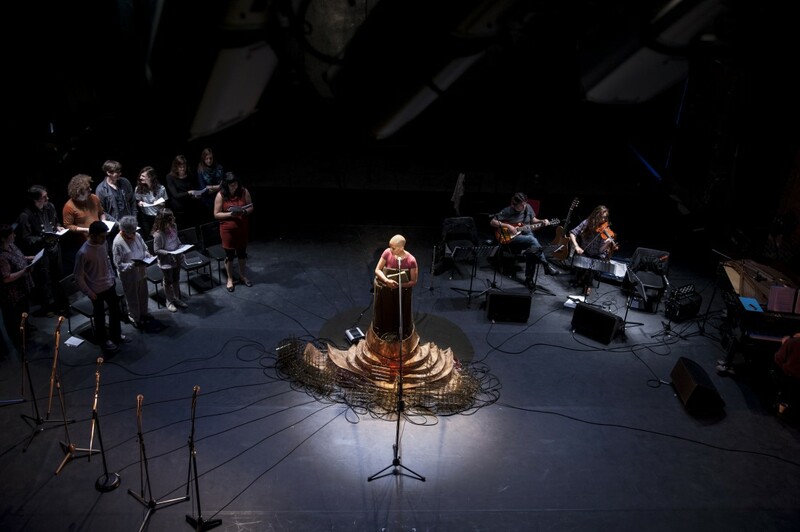 Rajni Shah Projects' large-scale musical piece Glorious was realised here in December 2012. This followed our commissioning and development support over 4 years to create a touring work that was re-written and reimagined for each location. Glorious toured to London, Newcastle and Belgium (Mons) before its final ever showing here at Lancaster. The final stage of Glorious in Lancaster was a month-long residency with us including interventions and workshops to recruit for, develop, stage and rehearse the piece in Morecambe and Lancaster libraries, in St. Nicholas' Arcade, Lancaster, and finally in our very own Nuffield Theatre. The finale here saw its largest cast ever – a 40-strong troupe of local musicians and participants performing alongside the professional team to a sell-out audience. The project is now captured in a new Live at LICA/Live Art Development Agency publication which can be bought here, having formed the centre-piece of a major London conference, Beyond Glorious, in May 2013. Filmmaker Lucy Cash made a music video especially with Lancaster participants, called Nine Actions, which forms part of the publication or can be bought seperately here. A blogpost about Glorious in Lancaster by LICA's Gerry Harris can be viewed here. Glorious evaluation can be downloaded here. If you have any further questions about Glorious in Lancaster, contact Alice on alice@liveatlica.org or 01524 592994.